Highlights of Astronomy contains papers presented at the Special Sessions and Joint Discussions of the General Assemblies. 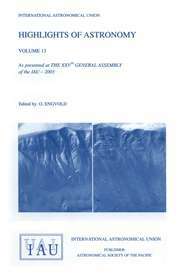 The volumes below comprise the Highlights of Astronomy archive of the IAU. Cambridge University Press are in the process of digitising the complete IAU archive and making the full archive freely available to the public. Highlights of Astronomy volumes will be added to the list below as they are digitised.